I have this thing going on in my head which I can only call ‘Voucher Guilt’. I’m sure that Freud or Jung would have identified it as a serious issue, if they had received gift vouchers back in their day but they didn’t so they didn’t. I get presented with Gift Vouchers occasionally – not an outlandish amount of them, Christmas, Birthdays, Circumcisions, you know the routine. I’m always glad to get them and I look forward to using them to get something nice. But then the time comes around when I’m required to use them and I get the sweats. I get guilty and uncomfortable and utterly ill-at-ease. I get Voucher Guilt. My worst problem is with restaurant vouchers. I know, it’s paid for and I know that the restaurateur knows this and that everybody in the world will be cool with me and my voucher. However this does nothing to prevent me from being the only un-cool person in the entire world. On those very few occasions where I misguidedly kept my voucher a total secret until the bill had to be paid, I have been reduced to a quivering mess as the manager prised the tear-soaked card from my pale shivering hands. The only way I can survive using a restaurant voucher is for me to slink furtively up to the manager very early in the evening and call him off to one side. Our conversation may go something like this. At which point a slightly deaf manager may raise the alarm and have me arrested. If I can get the management on my side quite early in the evening then I can usually get away with it. Still there will be dreadful pangs as I pay the bill with my voucher. I will think of the poor pot-washers and veggie preppers who are in the back and who were hoping for a little hard cash at the end of their labours. Instead they are about to find out that they were slaving on a job which they got paid for weeks before. Their families go hungry and it’s all my fault. The size of the guilt experienced is inversely proportional to the size of the restaurant or shop I am in. The size of the guilt is directly proportional to the age of the voucher. Oddly enough, my love of books seems to outweigh this ‘Voucher Guilt’ effect. The most common type of voucher I get is a book-token and I can turn up in the shop with these without hanging my head or having to consult the management. I feel comforted by the knowledge that book tokens are such an institution. Maybe in fifty years time, I will have got used to the other types of voucher too. Now, where did I leave that coffin voucher? Let someone else buy you dinner at the restaurant and give them the voucher (we call them coupons or gift cards here) to pay it with. Perfect solution unless you can't let someone pay for your dinner. You're too funny--I love using vouchers. Yes I *do* feel like a bit of a freeloader when doing it, but I'm ok with it ROFL. Coffin voucher.... hm, I like that idea. Maybe my next wedding anniversary!! That's so funny! Does the voucher affect what you order, too? Made me chuckle. I wouldn't worry. The great thing about selling vouchers is if they are for, say, fifty pounds, you know that the punter who uses it will either spend forty-five pounds and think so what or feel they need to spend up to the full value and probably end up spending fifty-five. Without the voucher he or she might only have spent thirty. Great marketting ploy. And then there's the people who get bought them and never use them! Money for old rope. I love it when you post on a Saturday, it gives me something to giggle about all weekend. I love the way you end your articles. You always leave a bit that gets one thinking all over again. One day, when I've grown up, I will also be able to write as well as you do. Thanks for a lovely story. I'm very much the same, Ken, in fact I have a voucher in the cupboard that I got for filling in some survey form and it's been lying there for probably a good six months. The last lot I got hung around for well over a year. I will use it and probably for a book. You're right paying for a book with a voucher isn't the same. I think this is because there is a long tradition with book tokens, they were given a prizes from schools and the like, reputable sources. And that makes them respectable. Laura: Nice idea, 'wouldn't work though - my guilt would go with the voucher no matter who presented it. Dominic: Valuable insight, thanks! :) I do try to console myself that some vouchers never get used and that is a real winner for the shop. As you might guess, I have a few of those myself. When I was a cashier I liked getting coupons, gift cards and such. It broke up the monotony of credit, debit and cash. Maybe you can think of it that way. The only time I feel guilty is if I get one to a restaurant we've been to that's AWFUL! Tug of war between logic [it's free food] and emotional [yeah, free BAD food]. I think you do right by asking if there is a problem using your voucher. By all means, use them. I wanted to purchase a table at the southwestern art place. My girlfriend was giving me gift certificates for birthday and Christmas so I could afford it. When I pulled them out to use them, they had all expired within a year of issue. ???? Vouchers, if I understand them correctly, are the same as Gift Certificates in the States. If this is the case, then they are pre-paid long before you eat. In other words, they are revenue the restaurant has previously received and is collecting interest on until you use your voucher. Restaurants in the STates sell as many gift Certificates as possible for Christmas Gifts. The reason? Because they represent revenue in January and February when they will be redeemed. January and February are the two slowest months in the restaurant industry. Selling gift certificates/vouchers ensures a revenue flow in those slow months. How you can feel weird about using a pre-paid gift certificate is something I can't wrap my head around. Your meal has already been paid for. You're just deciding when you want to eat it. We generally don't buy vouchers for presents, because somehow it feels like cheating and taking the easy option. Also they're not guaranteed if the company gets into trouble. Remember when Woolworth's stopped accepting vouchers because they went into receivership, even though they continued to trade for a couple of months? I tell you what, I'll help you. You give them to me and I'll spend them for you. I don't suffer from that particular guilt. Many others, I fear, but not that one. Following on from John of English Wilderness, I do suffer from voucher guilt when buying, but I keep having to remind myself that I love receiving them. You have another new photo up. How was the vacation? You look a bit shell shocked in the new photo. Did you forget your PIN at the check out? Or was the vacation a bit like an extreme holiday, jumping off walls and climbing the sides of steep hills... ? Well now that was an utterly misleading photograph you have used in your post. I was excited at the idea that you might have been in Canada! And then of course I was furious that you wouldn't have contacted me... and then sad to realise that it was only a stock photo from someone else's flickr stream *sigh*. 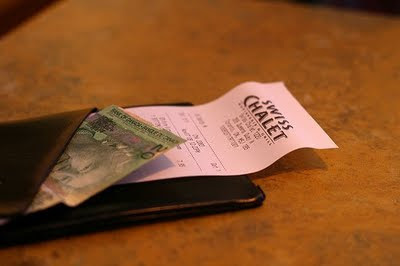 Just leave a decent tip, and you won't feel like such a cheapskate when using vouchers! Laura: I'll use that, if I may. Hope: I've had that too. I sat on a voucher where we had the most God-awful meal. Never-ever used it, which was fine. They closed eventually. Mkcoy: A person after my own heart, I can tell. John: There's a lot of this 'company going bust and not honouring vouchers' going on over here. So best use 'em early. Laura: I took the new photo last weekend, I was photographing the Open Tennis Championship (my wife won the doubles) and I has a mirror snap. I chose to use it 'cos it's pretty much how I look now although the stubble comes and goes.